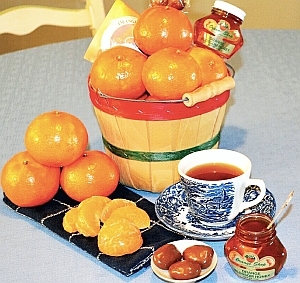 Rustic half peck grove basket filled with tree-ripened Florida Tangerines, tea and treats. Sweet, easy-peeling Florida Tangerines, genuine Orange Blossom Honey, Cinnamon Orange Rooibos Tea and Chocolate Amaretto-Coated Pecans. A wonderful "any occasion" gift.